Preheat oven to 180˚C. Cut the vegetables into 2cm chunks. 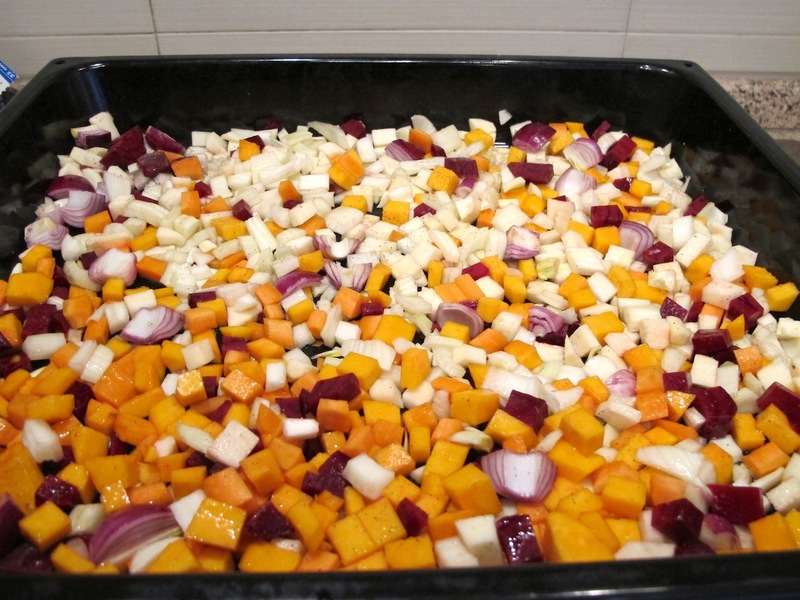 Place the prepared vegetables in a very large roasting dish and spread out to a single layer. Drizzle with oil and maple syrup and season with salt and pepper. Roast for about 45 -50 minutes or until the vegetables are tender and starting to caramelise. 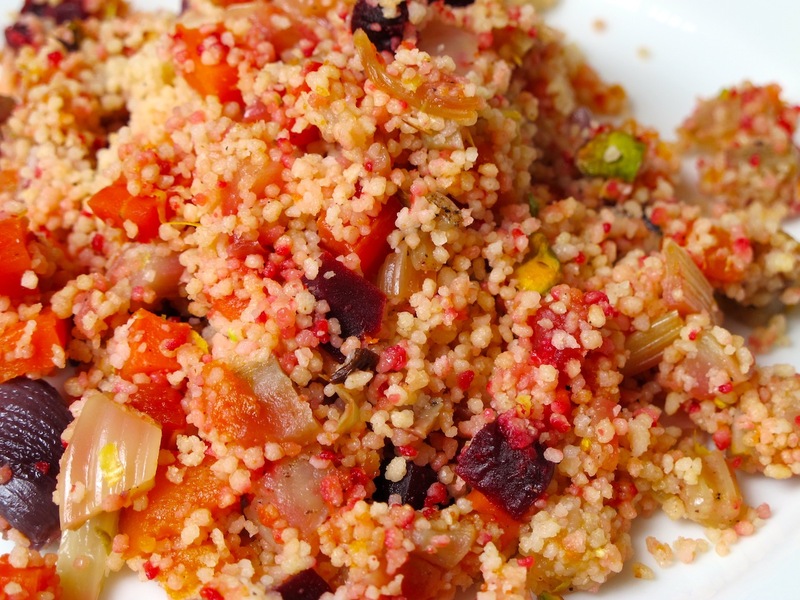 Add the roasted vegetables and lemon juice to the couscous and toss gently to combine and garnish with the chopped pistachios. Hot water or vegetable broth. Trim the bottom of the asparagus spears, discarding the woody bottoms. Cut the tips in 2-inch pieces and set aside. Boil the water and add pinch of salt and sugar and vinegar (it will remove the bitterness from asparagus). Cook on medium heat for 1 minute add asparagus tips and cook for one more minute. Drain and set aside. In a heavy bottom saucepan, heat the olive oil and sauté the onion until translucent, stirring often, about 5 to 6 minutes. If the heat is ho high and the onion starts to burn, add a splash of water. Add garlic, finely chopped parsley stalks and spice mixture and cook for one more minute. Add the rice, and stir to coat well with the onions and oil. Fry the rice stirring continuously for about 2 minutes. Add the wine to the rice and stirring often, cook until it has been completely absorbed. Begin to add the hot water and broth, stirring the rice until it has been absorbed before adding another. 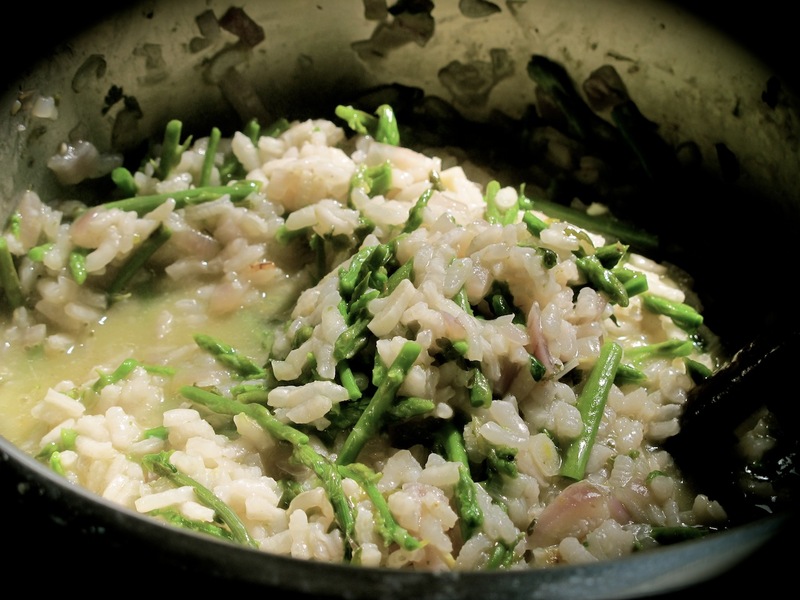 Continue to cook the rice in this manner until it is “al dente”, for about 20 minutes, add asparagus and cook for 5 more minutes. Remove from the heat and add butter, chopped parsley leaves, and parmesan. Serve. It’s time to make new stock of this beautiful spice mixture. During the winter months I add this mixture to almost every meal. 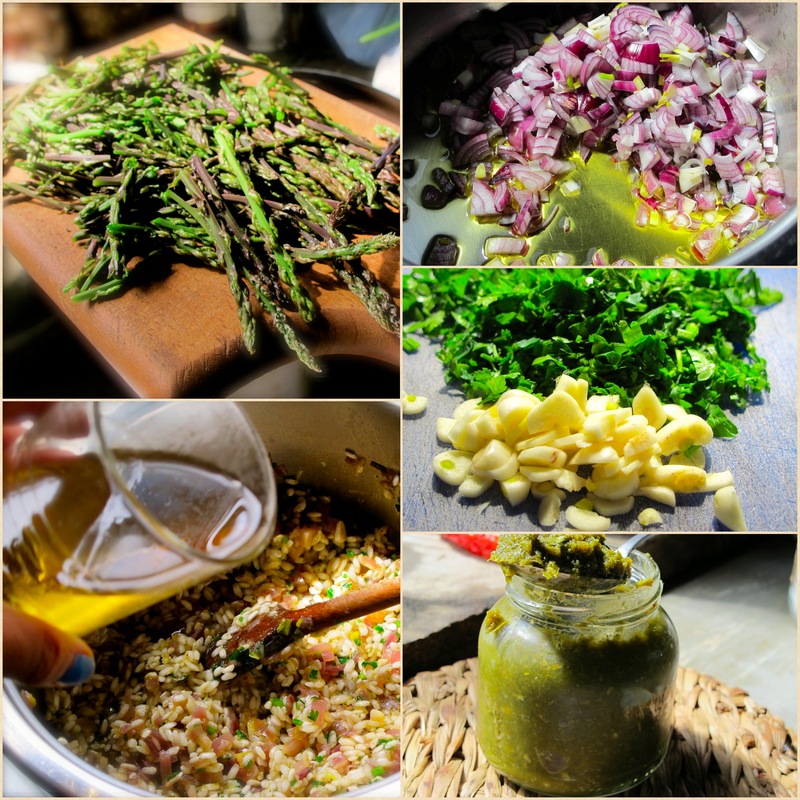 It goes well with soups, sauces, risottos… It adds freshness to every meal and the best thing is you know what’s inside. Wash the greens and cut them in smaller pieces. Divide in smaller batches and chop them the up in a blender. Mix everything together with a salt, cover with kitchen towel and set aside for 24 h in a cold and dark place. After a day, mix the ingredients again and put in sterilized jars. Close tightly. If using immediately, add all the remaining oil and pulse until smooth. Transfer the pesto to a bowl and mix in the cheese. Cook some pasta (reserve some of cooking water before draining) and stir in the pesto. If the mixture is to dry add a splash or two of cooking starchy liquid and mix well. Refrigerated, in an airtight container, and with a layer of olive oil on top pesto can last up to one week. Aloo gobi, in India that simply means: “potato cauliflower”. You can modify this recipe using sweet potatoes. Melt the butter in a large skillet over medium heat, adding some oil will prevent butter from overheating. Add the cumin seeds and gently fry them for a minute or two to heat them through (remove staleness and brighten their flavour). Add the onions and sauté until they soften. Add the cinnamon and curry powder and stir well for another minute or so. Add the potato and cauliflower and stir well to coat them with the spices. Season with salt, add a splash or two of water, cover with a tight-fitting lid and lower the heat. Continue cooking until the potatoes are tender, another 20 minutes or so. Just before serving, sprinkle with fresh cilantro. 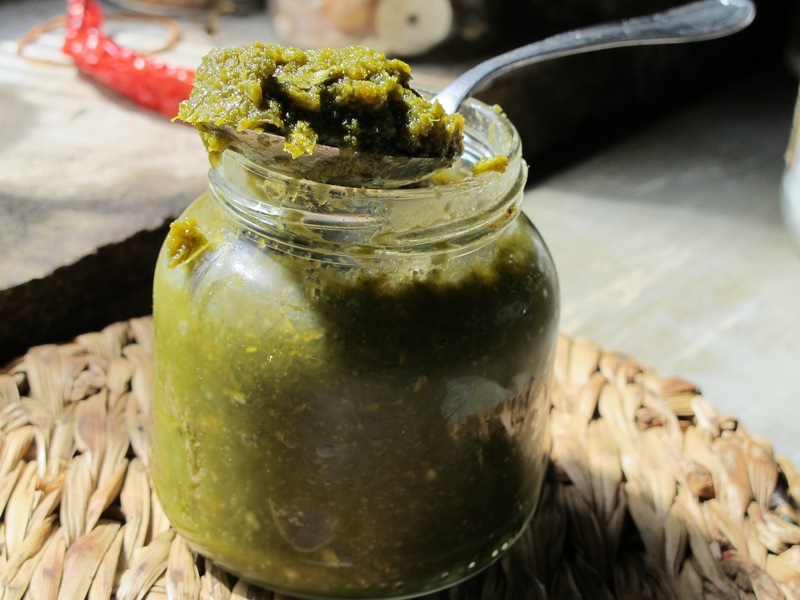 Put peas, egg, onion and garlic, cilantro, water and oil into a food processor and puree. Add flour, baking powder, curry powder and salt and puree until a smooth batter forms. Heat a skillet over medium heat and add oil. Using a small ladle, add batter to the hot pan to make small pancakes. Cook on the first side until bubbles form on top, flip and cook the other side until golden brown. 1. Slice the ginger as thinly as possible. It can’t be too thin, so use a sharp knife. 2. Put the ginger slices in a pot, add enough water to cover the ginger, and bring to a boil. Reduce heat and let ginger simmer for ten minutes. Drain, and repeat, simmering the ginger slices one more time. 4. Remove from heat and let stand for at least an hour, drain very well while the ginger is hot, so the syrup will drain away better. 5. Toss the drained ginger slices in granulated sugar. Shake off excess sugar, and spread the ginger slices on a cooling rack overnight, until they’re somewhat dry. The sugar can be reused in a batter or ice cream base, or for another purpose. It takes few days for ginger to be dry completely. If tossed in sugar, the pieces can be stored at room temperature for a few months.